Home > Men's Vintage Shirts > Sweaters and Cardigans > (L) Vintage 1980s "COSBY" sweater. Navajo Pac-Man! Black, Blue, Teal, Red, White, Yellow! Vintage 1980s "COSBY" sweater!. Classic 80's sweater in black, blue, teal, white, red and yellow! 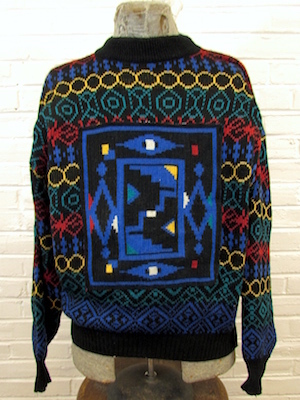 Sweater has a patch in the center with a Navajo-esque design that reminds us of a Pac-Man! Insane striped patterns in red, yellow, teal and blue! Neck, ribbed cuffs and hem are done in black. Tagged by Bolt. 100% Acrylic.